How Can You Download Youtube Videos to Android Devices? Meta: Enjoy your favorite Youtube videos even when there is no Internet connection. See how you can download the videos with video download apps. The number of uploaded videos on Youtube is now so huge that we can’t even watch all of them for the rest of our life. However, all of them are only accessible with the Internet connection. What if you are in areas without the Internet such as some remote countryside or an aircraft? If your answer is using a video download app to save your favorite videos then watch them offline, you read my mind. For Android users, this approach is quite easy as long as you can find a sufficiently stable Internet connection. However, there are still some technical issues that confuse some of you when trying to download videos from Youtube. Thus, today I made a brief guide on the easiest ways to download Youtube videos to your Android devices. Youtube, the Android version of the well-known video sharing service, has a function named Offline Viewing. This is the way to turn it into a video downloader app. Step 1: Start the Youtube app. First, you need to launch the app on your device. If it is not pre-installed, you can search and install it on the Google Play Store. Step 2: Search the video you’d like to save. You can type the name of the video on the Search Bar then click the Search icon. Step 3: Find the Offline feature. You can do this either by choosing the Add to Offline button right on the bottom of each video or using the menu icon. After choosing the offline mode, you pick up the video quality. The higher the quality is, the more space it takes from your device. When the resolution is chosen, the downloading process will begin. A little note for you is that not every video on Youtube is available for this offline feature. If you notice a cross in the place of the Offline icon, you are not able to use this mode for this video. Step 1: Go to the Homepage of the app. Step 3: Go to the Saved Videos section. You will see the videos you downloaded before. Click them and enjoy! The solution with Youtube app seems easy to do. However, there’s still a problem. Not everyone installing the Youtube app is eligible for the Offline Viewing feature. In fact, if you wish to use this feature, you must be either a Premium member or a user from some particular developing countries in the world like Asian or African ones. You can check this out easily by seeing whether the Offline Mode works in your device or not. If you don’t belong to those two categories, this solution is not for you. But don’t worry! I have another way to help you. That is using a third-party video downloader app for Android devices. You should take a look at the second part of this guide. There are various third-party video download apps for Android but here are my top 2 candidates. This is a great video downloader app for Android that you should never miss. However, it is not available on the Google Play Store. Instead, you have to access its official website and download an APK file. Otherwise, you can choose another trustworthy website that provides APK files for users. After downloading the file to your device, here are some steps you should take to make use of this video download app. The default setting of Android devices prevents all apps not available on Play Store from being installed. Therefore, you have to adjust some settings to install the app. In the Settings, you look for the Security section then go to Unknown Sources. Choose the option allowing the installation of the apps from unauthorized sources. Step 2: Install the app. Now you can run the APK file and conduct the installation. Step 5: Download the video. Once the video appears, you will see a green icon that allows you to download the file. After you click the button, the app will ask you to choose the video quality. You pick up one and then the downloading process will start. 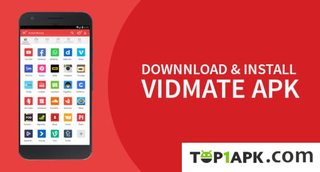 This is my second candidate when nominating top 2 video download apps for Android users. Its interface is easy to use and you can find the amazing videos here just by scrolling up and down. Also, it allows users to search Youtube videos right on the built-in search area. Regarding the ability to download videos from Youtube, this app totally can satisfy you. But the same as TubeMate, you have to grab an APK file from its official website and install it into the device before saving any videos from Youtube. Here is a step-by-step instruction for you. Step 1: Install the app. You can look at the instruction on how to install an APK file that I mentioned earlier. Step 5: Click on the video and go to the download icon on the right hand. Step 6: Select the resolution of the video and click download. Youtube videos are now not authorized to download by Google. What I try to do here is providing you with some solutions to satisfy your need while waiting for the day those files are officially allowed to grab. Do you have any other ways to download Youtube videos? Share with me on the comments. Or if you have any questions about what I mentioned, like about the video download apps I nominated, just let me know. I will try to respond as soon as possible!